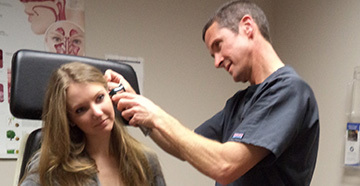 A diagnostic hearing evaluation is the first step to determine your hearing capability. If you have hearing loss, it will detail the extent, type, and specifics of your particular hearing loss. The evaluation is performed by Jessica Dwyer in the sound booth using special equipment called an audiometer. 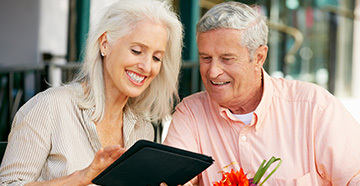 This evaluation can be conducted on people of any age, from newborn to older adults. Diagnostic hearing evaluations identify hearing loss, and gives Jessica important information to help determine the best course of action for treatment. Some types of hearing loss can be treated medically or surgically, so it's important that these types of hearing losses be ruled out before hearing aids or other treatment options are considered. The evaluation will probably last about 30 minutes. You should also allow time for discussion with Jessica to review your hearing test results and ask questions. If the determination is made that you need hearing aids, allow for sufficient time to discuss your options. A complete medical history will be completed and Jessica will want to hear about your hearing complaints. She will pay special attention to any concerns you have about exposure to noise, tinnitus, and balance problems. Please don't be afraid to ask questions. You will want to be clear on any information you receive so that you can be an active participant in finding hearing solutions that work best for you and your lifestyle. Hearing rehabilitation is an intricate process that requires working with an audiologist that is committed to not settling for less than the best hearing health care possible for you. Most hearing loss patients notice an improvement with any hearing aid trial, but the key is having a knowledgeable and experienced audiologist. 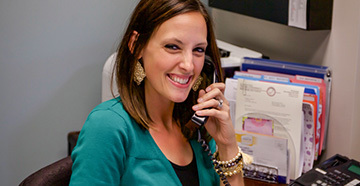 Jessica will help you find the right hearing aid style and fit for your hearing loss and lifestyle. She will work with you to determine the best fit for your needs.